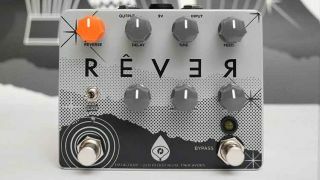 NAMM 2019: Old Blood Noise Endeavors and Datachoir have released a full production run of their Rêver pedal, a collaborative stompbox that combines modulated reverb, delay and reverse effects. The feature-packed pedal, previously announced as a limited edition last year, is controlled via seven knobs, two toggles and two footswitches, with the ability to combine familiar effects both forwards and backwards to create new textures. The Rêver is available for $229 direct from Datachoir or from participating dealers from February 15th.